Transparency is part of our DNA. We document our work meticulously so that we are accountable to our investors, nonprofit partners, key stakeholders, and the community. Our annual audited financial statements and Form 990’s are open to the public. VPP revenues vary year-to-year based upon the timing of the recognition of multi-year pledge commitments and the fundraising cycle. The full value of pledges are recognized in the year the commitment is executed, while payments are received over the multi-year period. 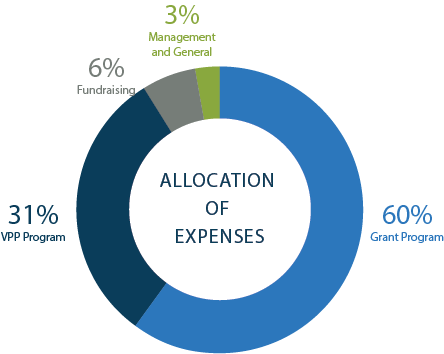 VPP’s expenses consist of direct investments or grants to support the strategic priorities and organizational capacity of the nonprofit organizations in which we invest. In addition, VPP’s operating costs include a programmatic component which is an integral element of VPP’s unique model. The VPP team is responsible for all aspects of investment portfolio selection and monitoring, building an engaged community of investors and sharing our lessons and experiences of our model and approach with the field. Providing subject matter expertise on specific issues. 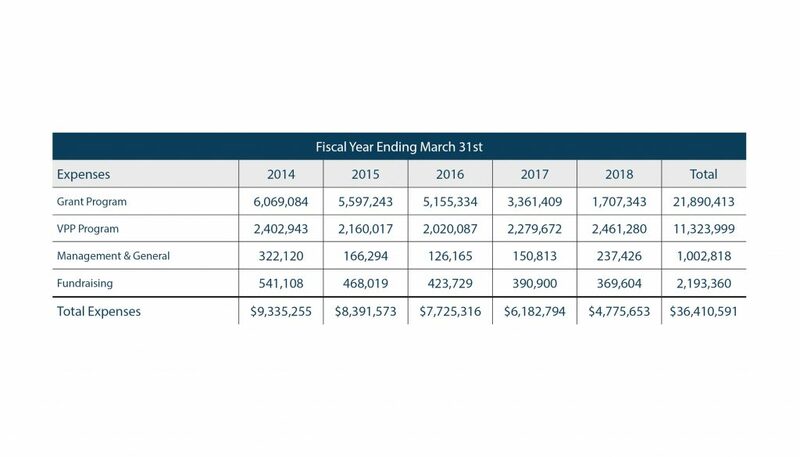 The fiscal year table and allocation of expenditures chart below show that VPP’s direct and programmatic costs have averaged 92% over the five-year period with management and general and fundraising expenses at 3% and 5% respectively. If you have any questions regarding the information provided, please contact Chuck Redmond, VP of Finance & Operations at credmond@vppartners.org.